In the advent of new developments in material for dentistry,one of the things that we are moving more towards is the use of metal-free resotrations. We have moved increasingly from using amalgams to resin materials like composite and glass ionomers .These new materials are not only more aesthetic,the newer reinforced ones have very superior strength. Where crowns( http://www.ismile.com.my/patient-education/crown/) and bridges(http://www.ismile.com.my/patient-education/bridge/) are concerned,there is an increasing shift to use non-metal-based prostheses. In a very simple way,these all-ceramic crowns are classified into low-strength and high-strength ceramic restorations. Low strength ceramics are leucite-reinforced pressed porcelain and these are used only in very specifically indicated cases.They have very good aesthetics but low impact-strength. High-strength ceramics are categorized based on the coping used and these copings are referred to as the core.These core material now replaces metal,hence the all-ceramic,metal-free restoration. Alumina-core ceramics have aluminium oxide as its core material under the pressed porcelain which is fused to it.Zirconia-core ceramics will have zirconia as its core material. Some of these crowns are done using the CAD/CAM technology.This method is capturing the photographic image of the prepared tooth model using computer technology ,a 3D restoration design is crafted to conform with all the detailed specifications,the computer will then send infomation to a milling machine where a block of core-material/ceramic will be milled to the specification. 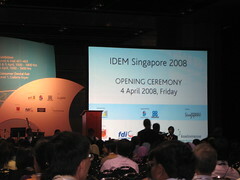 On the first weekend of this month,my colleauge Dr Amy and I took a break from our work routine and attended the IDEM(International Dental Exhibition and Meeting) at the Suntec Convention Centre in Singapore. There were some world-renowned speakers in the dental profession at the scientific convention and we learnt much. It was a nice change to be able to window-shop at the mall where the convention centre was.Well,we actually did some real shopping too 🙂 ,something we call “retail therapy”;something we do not get to do too often.